The Texas Legislature has been hard at work over the last six weeks, and I’m excited to report on our efforts to reduce the size and spending of government here in Austin.First off, I am delighted to announce that I passed my first bill through the Senate this week! Senate Bill 390 addresses court case backlogs by requiring court dockets to prioritize cases involving children under the age of 14. In a rapidly growing state like Texas, SB 390 ensures young victims of crime are able to find justice and closure by having their court cases dealt with in a speedy and efficient manner. I was proud to have bi-partisan support for this bill, with the final vote in the Senate being a unanimous thirty to zero. I’m also proud of the support I’ve gathered for Senate Bill 393. SB 393 relieves pressure placed on our courts by updating the thresholds for property crimes, which had not been updated since 1993. This measure balances the need for criminal justice reforms with conservative common sense. This bill received unanimous support in the Senate Criminal Justice Committee, and looks set to pass unanimously in the full Senate as well.Our most important task in the month of March was to work toward permanent, effective tax relief for all Texans. I was a co-author of Senator Jane Nelson’s Senate Bill 7. This measure eliminates the troubled franchise tax for small businesses. Those businesses with revenues of less than $4 million will now pay zero in franchise taxes, enabling them to hire more employees, expand, and increase wages. It also reclaims valuable time and effort small business owners previously wasted complying with the confusing franchise tax structure.As the session moves into the intensely busy months of April and May, my sights are fixed on fighting the rising cost of college tuition, increasing government transparency, and advocating for meaningful tax relief. I hope you’ll stay in touch with our office over the course of the 84th Session. First and foremost, our priority is to ignore the “Austin way” of doing business, and instead serve the people of Senate District 10. Our district office number is (817) 882-8157, and our Austin number is (512) 463-0110. You can also share your concerns and ideas with us at www.burton.senate.state.tx or feel free to drop by our Capitol office, GE.7, any time you’re in Austin. 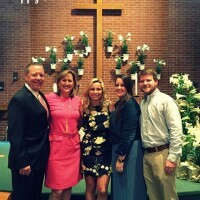 I was glad to be home in Tarrant County this morning for Easter Service. Being home with family and friends is an important reminder of why we fight in Austin for conservative principles. Thank you for your continued support. I hope you and your family have a blessed Easter!